This mind blowing spectacular showcases the jaw dropping talents of seven of the most incredible illusionists on earth. The Illusionists have shattered box office records across the globe and dazzled audiences of all ages with a powerful mix of the most outrageous and astonishing acts ever to be seen on stage. This non-stop show is packed with thrilling and sophisticated magic of unprecedented proportions. Audiences will witness stunning acts of grand illusion, levitation, mindreading, and disappearance. This group of world class performers take their cue from the showmanship of the great illusionists of the past such as Harry Houdini and pair it with a new and updated contemporary aesthetic, whose set and costumes design lend the genre theatricality and artistry that has rarely been seen before. Collectively these performers have been seen by millions of people around the world and this production showcases their incredible talents together on stage for the very first time. Having shattered box office records around the world, The Illusionists will soon captivate Cape Town and Jozi. Full of hilarious magic tricks, death-defying stunts and acts of breathtaking wonder, The Illusionists dazzle audiences of all ages across the globe. 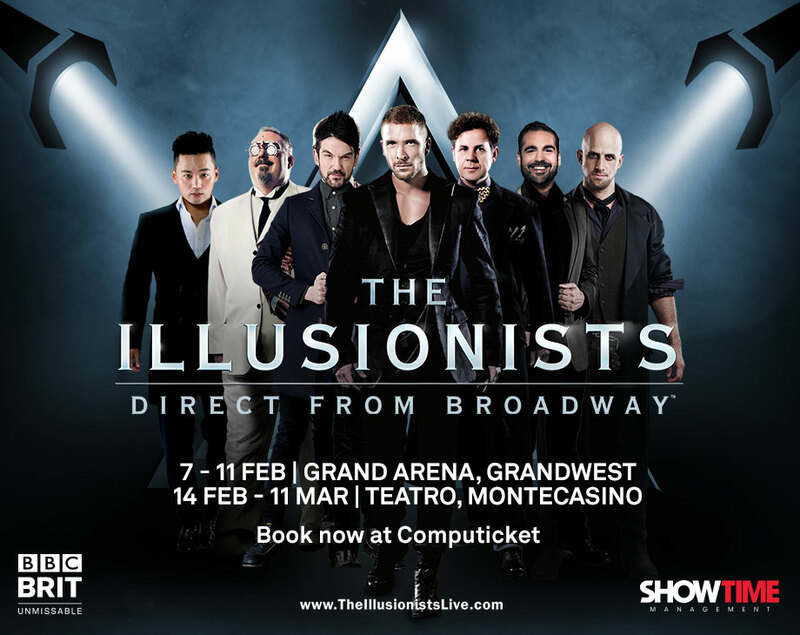 The Illusionists Direct from Broadway is produced by The Works Entertainment and brought to South Africa by Showtime Management and BBC BRIT. Take a moment to meet The Illusionists http://www.theillusionistslive.com/. Follow The Illusionists on Twitter: @Illusionists7 or on Facebook. It’s not an illusion, tickets are selling fast. Book now at Computicket by calling 0861 915 8000, visit www.computicket.com or your nearest Computicket service centre.. For further information visit www.showtime.co.za or www.montecasino.co.za or www.grandwest.co.za Special hospitality packages as well as Show & Stay packages available from Montecasino Hospitality & Corporate Events, (011) 3674250 or montecasino.reservations@tsogosun.com.